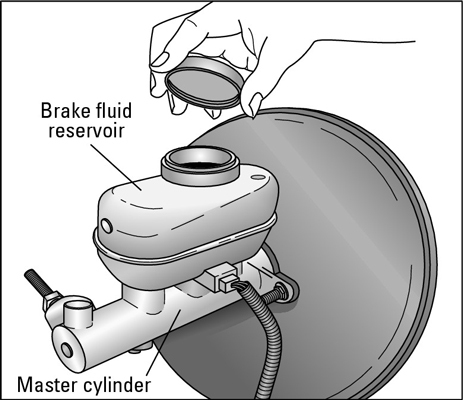 To check your car’s brake fluid, you have to find the reservoir. Its location depends on the type of car you have. The brake booster is on the driver’s side of your vehicle, usually up near the firewall. Just in front of that, sitting on and connected to the brake master cylinder, is the brake fluid reservoir, usually a plastic canister like the one shown here. Unscrew the cap of the reservoir. Older vehicles don’t have a plastic reservoir; instead, the master cylinder is a little metal box with a lid that you must remove to check the fluid level. Release the lid of a metal master cylinder with a screwdriver. When you put your foot on the brake pedal, the fluid in the master cylinder moves down the brake lines to the front and rear brakes. If there’s insufficient brake fluid, air is introduced into the brake lines and your vehicle doesn’t stop properly. Therefore, it’s important to keep enough brake fluid in your brake fluid reservoir. If your vehicle has an anti-lock braking system (ABS), consult your owner’s manual before checking your brake fluid. Some ABS systems require you to pump the brake pedal approximately 25 to 30 times before opening and inspecting the fluid reservoir. Clean the top of the reservoir carefully. A small amount of dirt falling into the fluid can cause the internal seals of the master cylinder to fail. Your brakes will begin to lose effectiveness and ultimately fail completely. Open the top of your brake fluid reservoir. If you have the kind with a little plastic reservoir on top, just unscrew the cap of the reservoir. If you have a metal master cylinder that contains the reservoir, use a screwdriver to pry the retaining clamp off the top. Don’t leave the master cylinder uncovered or an open can of brake fluid sitting around for too long. Brake fluid soaks up moisture to keep it from settling in the hydraulic components and corroding them. If moist air gets to brake fluid for as little as 15 minutes, the fluid is ruined. So don’t dawdle, and keep the can tightly closed until you’re ready to use it. 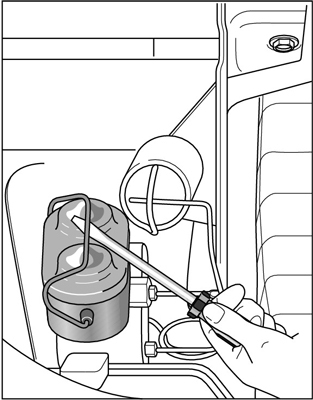 Look to see where the fluid level lies; make sure that the brake fluid level is within half an inch or so of the cap. If the level isn’t high enough, add the proper brake fluid for your vehicle. If the brake fluid reservoir is empty when you check it, you may have to bleed the brake system. Check the color of your brake fluid. Because brake fluid deteriorates with use, it should be replaced by a mechanic if it’s dark in color. Have your brake fluid changed every two years. Doing so protects the hydraulic components from internal corrosion and premature brake failure. Brake fluid is toxic, so take any rags with more than just a couple of small spots of fluid on them and any partially used cans of fluid to a toxic waste center for disposal. Don’t get brake fluid on anything that’s painted because brake fluid eats paint. If you spill any, wipe it up immediately and dispose of the rag ecologically! Don’t get grease or oil in your brake fluid; either one may ruin your hydraulic brake system.